Stroke is the fourth leading cause of death and a common cause of long-term disability in the United States, but doctors have very few proven treatment methods. Now a new device that mechanically removes stroke-causing clots from the brain is being hailed as a game-changer. In a recent clinical trial, the SOLITAIRE Flow Restoration Device dramatically outperformed the standard mechanical treatment. Findings from the trial, called SOLITAIRE With the Intention for Thrombectomy (SWIFT), are published online today in the journal The Lancet and will also appear in a later print edition of the journal. SOLITAIRE, which was approved by the U.S. Food and Drug Administration in March, is among an entirely new generation of devices designed to remove blood clots from blocked brain arteries in patients experiencing an ischemic stroke. 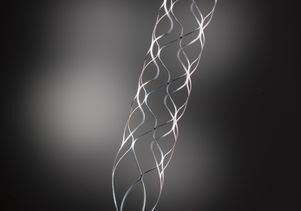 It has a self-expanding, stent-like design, and once inserted into a blocked artery using a thin catheter tube, it compresses and traps the clot. The clot is then removed by withdrawing the device, reopening the blocked blood vessel. "This new device is significantly changing the way we can treat ischemic stroke," said the study's lead author, Dr. Jeffrey L. Saver, director of the UCLA Stroke Center and a professor of neurology at the David Geffen School of Medicine at UCLA. "We are going from our first generation of clot-removing procedures, which were only moderately good in reopening target arteries, to now having a highly effective tool." Results of the study showed that the device opened blocked vessels without causing symptomatic bleeding in or around the brain in 61 percent of patients. The standard FDA–approved mechanical device — a corkscrew-type clot remover called the MERCI Retriever — was effective in 24 percent of cases. The use of SOLITAIRE also led to better survival three months after a stroke. There was a 17.2 percent mortality rate with the new device, compared with a 38.2 percent rate with the older one. About 87 percent of all strokes are caused by blood clots blocking a blood vessel supplying the brain. The stroke treatment that has received the most study is an FDA–approved clot-busting drug known as tissue plasminogen activator, but this drug must be given within four-and-a-half hours of the onset of stroke symptoms, and even more quickly in older patients. When clot-busting drugs cannot be used or are ineffective, the clot can sometimes be mechanically removed during, or beyond, the four-and-a-half–hour window. The current study, however, did not compare mechanical clot removal to drug treatment. For the trial, researchers randomly assigned 113 stroke patients at 18 hospitals to receive either SOLITAIRE or MERCI therapy within eight hours of stroke onset, between January 2010 and February 2011. The patients' average age was 67, and 68 percent were male. The time from the beginning of stroke symptoms to the start of the clot-retriever treatment averaged 5.1 hours. Forty percent of the patients had not improved with standard clot-busting medication prior to the study, while the remainder had not received it. At the suggestion of a safety monitoring committee, the trial was ended nearly a year earlier than planned due to significantly better outcomes with the experimental device. 2 percent of SOLITAIRE-treated patients had symptoms of bleeding in the brain, compared with 11 percent of MERCI patients. 58 percent of SOLITAIRE-treated patients had good mental/motor functioning at 90 days, compared with 33 percent of MERCI patients. The SOLITARE device also opened more vessels when used as the first treatment approach, necessitating fewer subsequent attempts with other devices or drugs. "Nearly a decade ago, our UCLA Stroke Center team invented the first stroke retrieval device — the MERCI Retriever — and now we are pleased to have helped develop and successfully test a superior, next-generation clot removing device," said Dr. Reza Jahan, associate professor of radiology at UCLA and the study's principal neurointerventional investigator, who also led the pre-clinical studies. "It is exciting to have a highly effective new tool that can improve the outcomes for more stroke patients." Additional co-authors included Dr. Elad Levy, Dr. Tudor G. Jovin, Dr. Blaise Baxter, Dr. Raul Nogueira, Dr. Wayne Clark, Dr. Ronald Budzik, Dr. Osama O. Zaidat and the SWIFT trial investigators. Covidien, the manufacturer of the SOLITAIRE device, funded the study. The SOLITAIRE device is cleared by the FDA for use in the United States and is also approved for use in Europe. Saver and Jahan received compensation from Covidien as scientific consultants for the design and conduct of the trial. The UCLA Stroke Center, recognized as one of the world's leading centers for the management of cerebral vascular disease, treats simple and complex vascular disorders by incorporating recent developments in emergency medicine, stroke neurology, microneurosurgery, interventional neuroradiology, stereotactic radiology, neurointensive care, neuroanesthesiology and rehabilitation neurology. The program is unique in its ability to integrate clinical and research activities across multiple disciplines and departments. Founded in 1994, the UCLA Stroke Center is designated as a certified Primary Stroke Center by the national Joint Commission on Accreditation of Healthcare Organizations.